The covergence of three critical problems may create a perfect storm in the nation's schools. Next year high schools across Turkey will teach 12th grade for the first time as a result of the reform of the old 3-year high school curriculum. This means that the enrollment in every high school in Turkey will suddenly jump by up to 33% (in the remarkable event of no drop-outs). Even if every square inch of office space, libraries and labs is appropriated, many schools will still not have room. Add to the mix the slow uptake by the centralized education planning, which planned for some increases in teacher training schools, but by no means by the 33% predicted by my simple arithmetic. As a result, we expect new teacher recruiting to see brutal competition this year, but this will probably not completely avert the need for teachers to take on extra hours, especially when you consider that Turkey's population is still growing. Now, consider those new teachers coming into their first teaching job this fall, bright and fresh, settling into overcrowded schools amid overworked teachers. But what will they have to offer? Radikal reported last week on a report by former Ministry of Education official Prof. Galip Karagözoğlu, detailing the deficiencies of teacher training programs across the country. The number of students in teacher training programs is increasing dramatically, but they are now facing a severe shortage of education professors. In some universities, programs with more than a thousand students have only a couple professors on hand, and some rely solely on assistant professors. As a result, nearly 200 students sit in classes. In a survey of 64 teacher training programs, technical equipment is rare or nonexistant. The report cited 22 schools with no physics lab, 20 with no chemistry lab, and 34 with no foreign language lab. In Mersin, there is one computer available to 659 students. These new students, the ones with no professors and no science labs, are also part of a shift in ideology: 20% of education students are opposed to coeducation (boys and girls studying together). In a test of general knowledge, 53% did better on religion questions than on science. Link: Radikal-çevrimiçi / Türkiye / Öğretmen nasıl öğrenir! 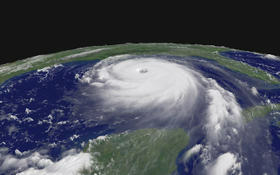 Photo: Satellite image of Hurricane Katrina by NOAA, Aug 28, 2005.